Many claim that when all things fail, the bird feeder pole can actually save the day. And I couldn’t agree more. 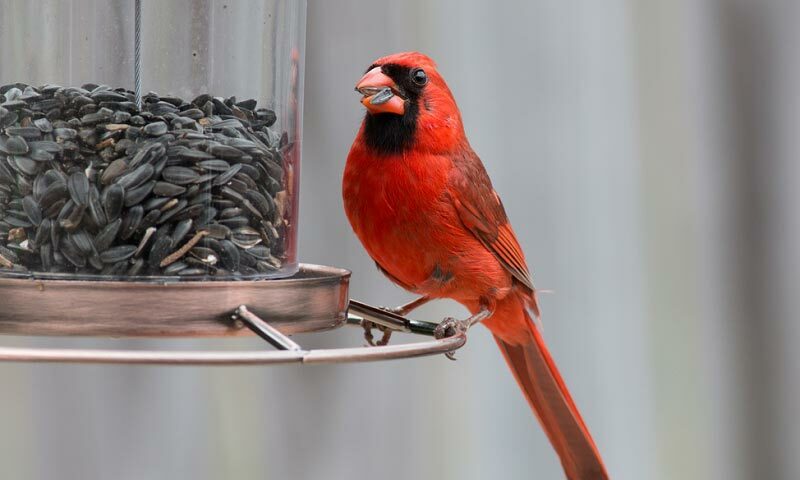 True birders know that the size, the location and the durability of the bird feeder defines whether the bird watching experience is a success or a fail. 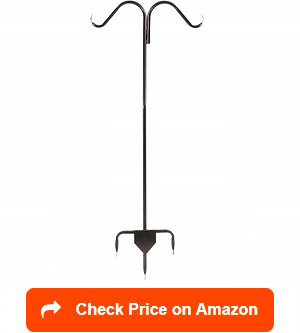 For this, getting the best bird feeder pole is a must. Having a good bird feeder will attract birds to your yard. The kind of seeds you put will make them decide whether to build a nest near the food source or not. To do this “law of attraction”, having a good bird feeder pole will make your feeder stand out or noticeable. Birders know that birds get attracted to feeders placed at different heights. 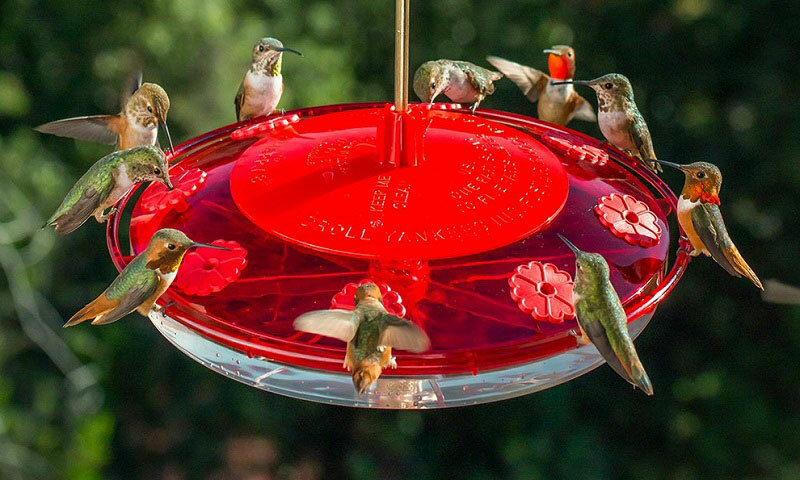 Hanging feeders can attract specific kinds of birds such as hummingbirds while woodpeckers and chickadees like feeders up high. Of course feeder poles can also spell disaster or safety. Most feeders nearer to the ground means they are prone to be attacked by predators such as cats, dogs, raccoons and sometimes foxes. Finding a good birdfeeder can be tricky. Read through and find out which one might work best for you. Some feeder poles are not just for bird feeders but can also beautify your living space by adding planters, pots and lamps. The GrayBunny product is literally multipurpose freestanding mount for humming bird feeders and some more accessories. 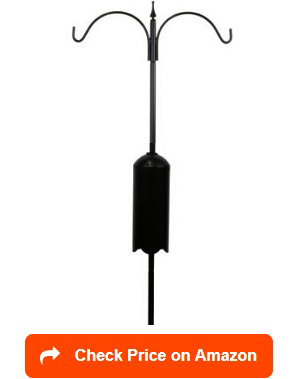 I like this bird feeder pole for two reasons: it is elegant and sturdy. It is made of strong solid metal, which means that it will stay for a long time. 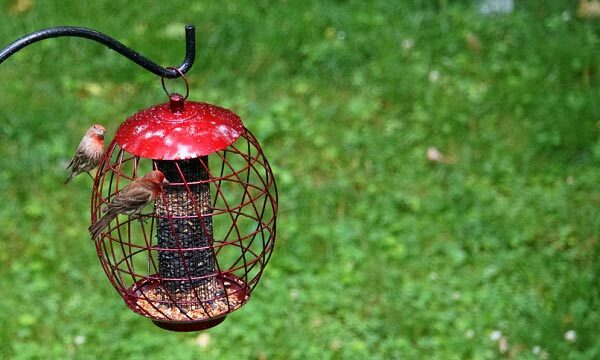 The versatility of this feeder also makes this pole better than the rest. Because it has a good design, it can be used for other useful functions. It can carry quite a heavy load so that’s a real plus as well. However, while birders think that it is made elegantly, the height requirement for a safe and effective may not be the best. To make sure that they are good enough for your yard, consider the length that goes into the ground and the part left for the actual pole. Still, despite this flaw, the GrayBunny Shepherd is worth the try. Having a tall feeder pole may be the easiest way to attract birds especially the ones that flies high up in the air. There are also birds that comes to enjoy fly through bird feeders and what’s best way than to hang them in a good, sturdy pole. But unless the fly through feeders are attached to a pole high enough for squirrels to attack, then they are going to be fun for the birds and for you. Hence, this heavy-duty ultra pole with shepherd’s hook by Achla may be the best choice for this purpose. It’s height of at least 91” will surely keep the raccoons, squirrels and other ground predators away. This is probably the best squirrel proof feeder pole so far. What is great about this pole is that it comes with two hooks, opposite each other, which means more balance than other ordinary poles. 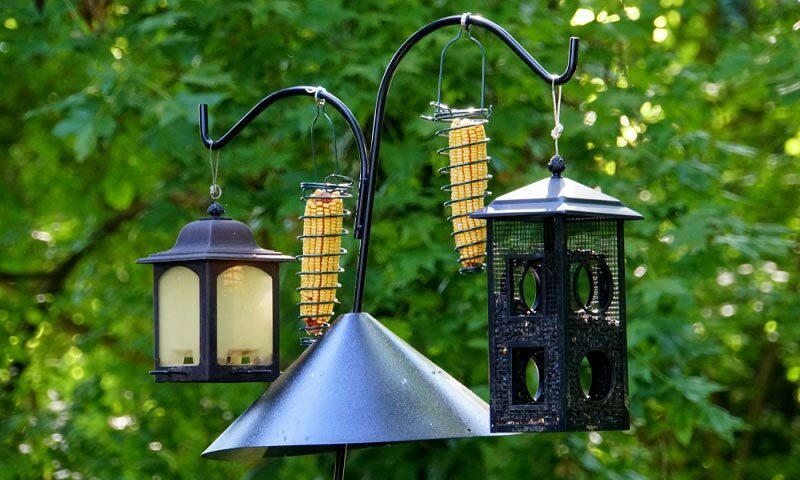 Your can put two smaller bird feeders or a bird feeder and a water cup on the other. Either way, it will be great at attracting more birds to your yard. I used it to put different kinds of birds feeders so I get more variety of birds using just one installation. How cool is that? To withstand weather, the pole is also powder coated, giving it that extra strength. Still, most products don’t come with no flaws. Storms may not still be very friendly to this pole. But well, storms can topple a tree so a bent pole after a strong storm should understandable. Nonetheless, I think it is worth the money. For a birder, pesky squirrels are always the biggest enemy. Stopping them therefore becomes a priority before one can begin to enjoy bird watching. But how do you finally stop squirrels from climbing bird feeder poles and stealing all the nuts, birdseeds and treats? The squirrel stopper pole and baffle set might just be the key. The manufacturer, Squirrel Stopper is dedicated at finding ways to stop squirrels from ransacking bird feeders. It is very keen on making sure birds get their food and squirrels are away, always. Made with 16-gauge steel, powder coating, and 8 feet tall pole can hold hanging feeders, birdbaths or even flower baskets. I love this pole because the manufacturer creatively placed an inverted cone-shaped squirrel baffles in the middle of the pole making it squirrel proof. While the price may be a bit much, I can say it is worth every dollar, as you will finally stop from looking out after the feeders as often – waiting for pesky squirrels to attack anytime. In addition to its purposeful built, the black squirrel stopper pole is designed beautifully, almost Victorian themed thus making it great for your yard. There’s definitely more things you can do to a bird feeder pole. One of them is possibly to use it to beautify your home or your garden without breaking the bank. On top of these is GrayBunny Station Kit, a bird feeding station in your own backyard. 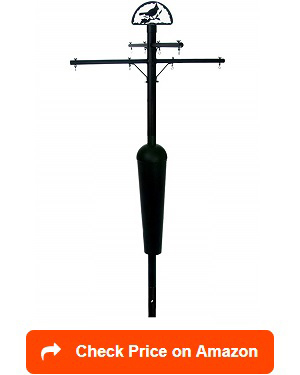 It is great for bird watching as everything you need to attract varieties of birds are in one single pole. This is probably GrayBunny’s bird feeder pole system as it is literally all-in-one. I particularly love that the hooks are great for hopper, tube and even nyjer feeders, which are all attractive to smaller types of birds like finches or even junocs. There is also a tray for mealworms and additional hooks for anything else extra. Technically, I’d hang suet baskets and a plastic water for bird baths. This is ultimately the haven for varieties of birds, which may come at the same time or on schedule depending on their particular feeding time. Either way, you will never run out of birds to feed or watch. 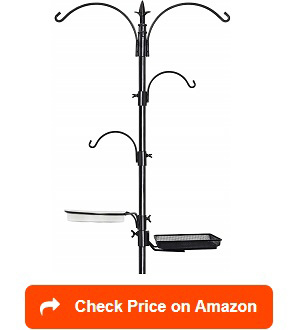 I also like it because it is made of heavy duty materials, rust-resistant and everything else adjustable depending on the height and the birds you are trying to attract. Feeders for high flyers on top and feeders for low ones below. As expected, squirrels might get attracted to this pole because it has everything in it. So putting on a squirrel baffle to deter the pesky climbers from joining the feast. The flaws? It is hard to figure out but with the height after installation might make it a bit hard to refill for shorter people. Getting a chair or a ladder on standby might be helpful. Green Esteem normally produces really good products for birds. Not this one though. Still there are really great things about this product that is worth the try. Depending on your yard, the kind of bird feeder pole is an important decision to make. If you have a big yard and expect a lot of bird throughout the springtime, then perhaps getting a bigger pole with plenty of hooks can be used. 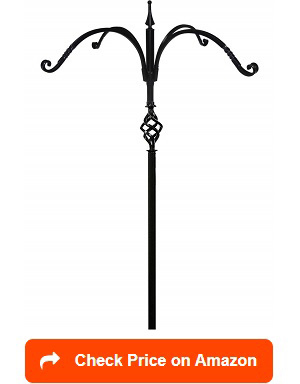 If you do have a smaller yard, then getting this wall-mounted bird feeder pole by Stokes Select is a great option. It is not just a space saver but it is practical and efficient too. I like this wall-mounted design placed near my window feeders, as it provides me the perfect view for birds while drinking my morning coffee. In addition, I also like the idea of having more choices of birds coming near the window. The beauty of birds in various colors. Where to mount is actually flexible. I recommend that if you do not have a wide window, then placing it in the fence will also do the trick. This will surely help you out get rid of the bird droppings, which may need plenty of cleaning if mounted by the window. If you do not have a choice, placing it parallel to the bushes might just do the trick. The fact that it can be rotated 360 degrees will surely make things a lot easier. Adjust it and use it the way you want it. Birders rated this 4 of 5 for design and strength to hold heavy feeders. The only downside of this product is that it may sway when the wind is strong so attaching it to a solid wall, or a solid fence might be a great idea. When doing so, I recommend considering height from the ground to make sure no squirrels or other predators will come steal the seeds from the birds. Some birders love the convenience of adjustable and no fuss poles. GrayBunny answered such call and manufactured a cheaper alternative to ground-based bird feeder poles. 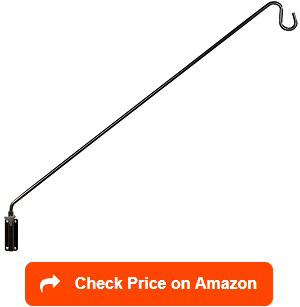 True enough, this heavy-duty deck hook has a great design and can be moved wherever you please. I love the simplicity of this product. Putting several of this well-designed hook to the upper balcony will provide both aesthetic and functional systems. It is multipurpose and I can hang planters in between the bird feeders. When birds come, they won’t only get attracted by the feeders but by the flower baskets as well. From the ground, it creates a great view of the balcony. Since the pole is rust resistant, it does not need to be kept indoor during the winter season. The distance of the pole to the balcony is a mere 37 inches, which makes it easier for me to fill it up with seeds when needed. While it is an absolute beauty, there is a possibility of it being visited by squirrels or by rodents (if there’s any in the house) as the distance may not be too long. Also, if the balcony is not on top of the front porch, it may create some mess down below. If that is your situation, clamping it on a fence will also do but leave the planters behind for aesthetic. Aside from that, most birders actually rated this product 4.5 for its simplicity, easy assembly and its aesthetic value. Most birders do not just do it as a hobby. 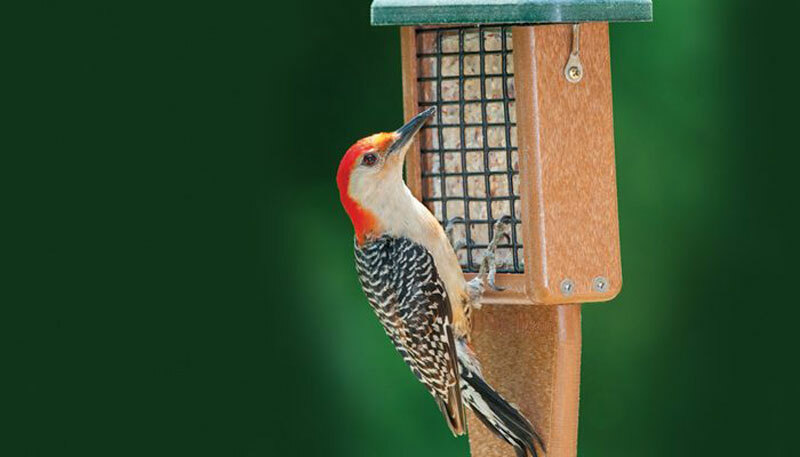 Some does it because putting up bird feeders can also mean beautifying their own backyard. 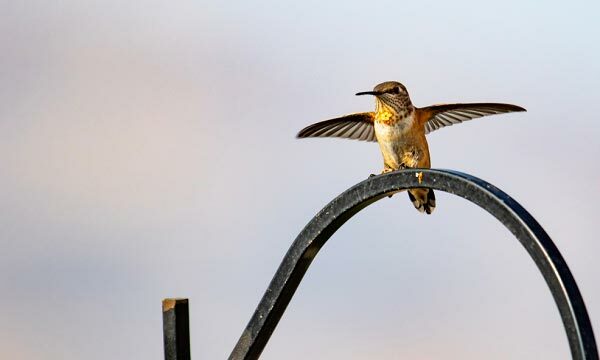 To add backyard aesthetics, attracting hummingbirds might be a great idea. So, is your bird feeding hobby part of your garden styling? If so, then getting your own shepherd hook is the best way to go. It is stylish and beautiful and it can be used for bird feeders or even as an outdoor plant hangers. To add to the many good features of this pole, it is also powder coated so it is resistant to rust. I love that it is just beautifully designed but it is also heavy duty, it can hold 15 pounds of bird feeder and seeds as well as potted plants as needed. For anyone who does not know anything about metal installation, this product is a go to. It comes ready to do its job, no assembly needed. The only possible downside of this pole is that it may not be tall enough to work on birds that are high flyers but hummers should be fine. Birders who likes smaller birds even rated it 5 for its quality, durability and functionality. At its price, way lower than most poles, this is definitely worth the buy. Are you constantly battling with squirrels? Then it is time to be more practical with your choice of bird feeder pole. There are few ways to make sure that squirrel will leave your bird feeders alone. This includes things like installing baffles to deter squirrels from getting into the feeder. If things fail, then there’s always Kettle Moraine squirrel proof pole set to the rescue. This heavy-duty steel piece makes sure that the squirrels are out of the picture, and finally away from ransacking your bird feeder. While birders have different experiences with the product, many have rated it 5 for its functionality. Even the tree rats can’t get to the bird feeders, making it more effective than other feeders of the same purpose. Aside from being squirrel proof, the part that works well is the pole stand, which is strong enough to withstand even the harshest of winds. However, to make it work better, it is important to consider the location of the feeder. Where you put it, away from trees or ledge will ensure forever bye bye to predators like squirrels. Perhaps, the only downside of this product is that it can’t be used for high-flying birds as the length is a mere 85”. Still, birds like finches and orioles or even hummers will be very happy with the pole. 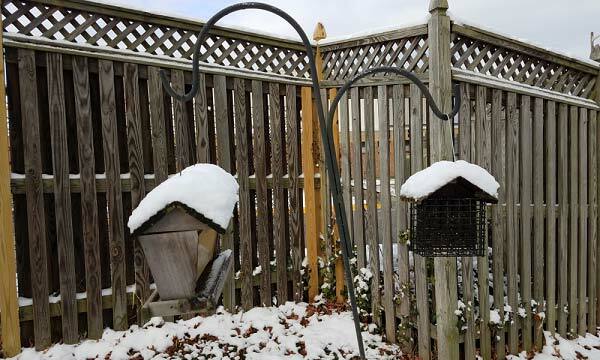 Bird feeder poles may not be the center of the birding activity but it sure is an important element of a bird garden. Certainly, you would want to look at aesthetically pleasing pieces of furniture at your garden – including the places to hang those expensive bird feeders. If you intend to make pretty garden bird hangers, then Erva’s decorative quad hanger is perfect for the job. It requires a giant, literally to reach the end of the pole, which makes it impossible for even the strongest raccoon jumper to reach. I personally recommend this product, not only because of its height but because it is possibly the best there is for high-flying birds. Bigger birds love this pole more than any other. Also, if you have been having trouble with cats and squirrel, there is no way they can climb this extra tall hangers. They have no choice but to wait for birdseed droppings, if there’s any of the ground. A perfect pole except when you are short. If that is the case, refilling it will be a problem. Getting a ladder to reach the feeders will do the trick, but can be a hassle. Do not leave the ladder leaning on the pole when you are done with it, or squirrels and sneak up and feast on the expensive seeds. Despite that, it is worth the price, which is a bit high on the market. Birds Choice is a good choice. That is one of the things I am certain about. So far, birds choice manufactures products that are truly amazing and practical for the birds – bird feeders, seeds and poles too! Squirrels are pests all birders want to get rid off completely. Not only do they destroy the feeders but they also eat all of the seeds leaving nothing to the actual recipients, the birds. Good thing the 2 arm topper product of Birds Choice can solve that problem. 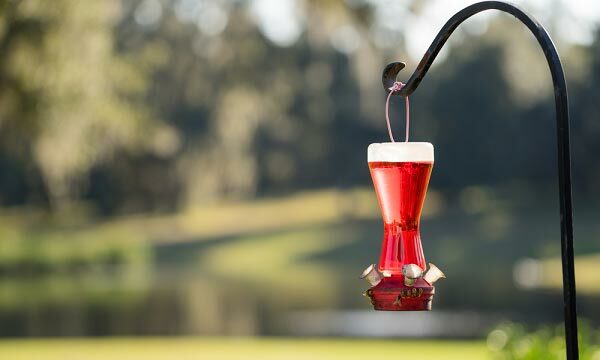 While it may not be the best product in the category, this 2-arm bird feeder allows anyone to enjoy watching the birds in action (or feeding session), while keeping the squirrels at bay. It is sometimes funny to see them trying to get into the feeder but the squirrel baffle just does not allow it. 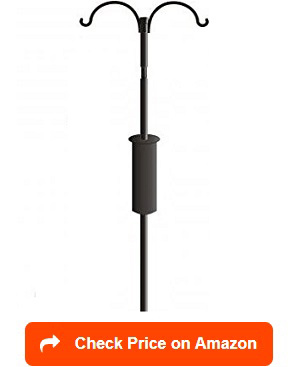 I recommend this heavy duty bird feeder pole for three reasons: it has an effective squirrel baffle, has complete kit to hang two feeders and it is priced lower than poles in the same category. It’s two hooks allows a more balanced feeding station, perhaps a feeder and a bird bath or if you want to see more colorful birds, then two different feeders to attract other varieties. The only downside in this pole is that it is not a complete set. Some poles have hooks for suet, and birds and jellies but this one has only two. Nonetheless, it will be perfect for beginner birders. While bird feeders are popular, the correct bird feeder pole might just save the day. While options on where to hang bird feeders are endless, using a bird feeder pole to hang specific bird feeders is a great idea. Unlike hanging them on roof or trees, installing your own bird feeder will give you control on which part of your yard do you want the birds to go. As a suggestion, installing them within vision, near the veranda or a large window, will give you the chance to watch the birds in action without necessarily getting out of the house. There are many types of poles. Some requires a simple insertion to the ground while some requires a more complicated assembly procedure. Whichever you choose, you can always work things out the way you want it. As a rule of the thumb, go for bird feeder poles that are weather resistant, squirrel proof, sturdy and easy to assemble. A pole that is made of solid steel is more ideal. If you are still unsure, read through the different types of bird feeder poles. Non-birder might look at them as ordinary poles. Not much of use except to hang bird feeders. However, birders know the difference of a straight pole to purposeful ones. There are several types of bird feeder poles. The differentiation is normally based on their purpose or functionality. For starters, bird feeder poles should be squirrel stopper — the last standing enemy of birders – squirrels. These pesky things have the ability to climb even the most impossible ones. 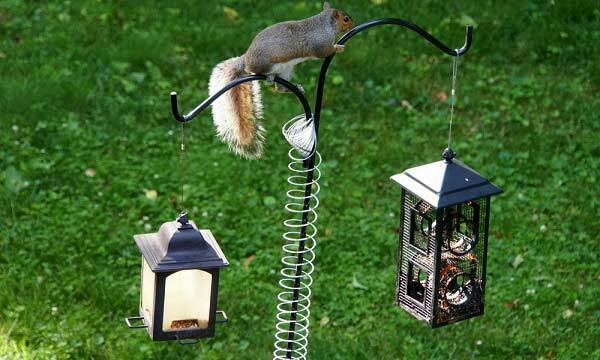 Squirrel Proof – to be truly squirrel proof, a pole must have a cone or a cylinder squirrel baffle. The bird feeder hangs above the baffle to protect them from these seed-stealing creatures. See the squirrel stopper pole among the pole products above. Raccoon Proof – sadly, birds and birders do not just worry about squirrels. If your yard is near the forest, expect raccoons to come visit once in a while. Getting a raccoon proof pole is the answer. Raccoon proof poles have of course raccoon baffles, larger in size to block animals like raccoons. The idea? Feed only the birds and let these animals find food somewhere else. Deer Proof – Yes, sometimes a deer might find its way to your feeder. This does not only make your feeder vulnerable to bigger animals but might endanger the birds in general. Deer proof pole means taller (about 10 ft steel pole) and long upward looking hanger arms. A normal whitetail deer can only stand 6 to 8 feet so approximating the pole’s distance from the ground will surely let you keep both the seeds and the birds. 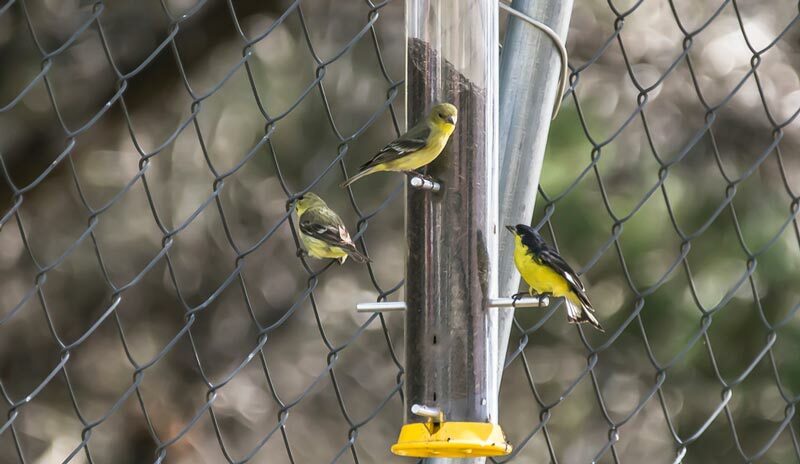 Small Bird Feeder Station Poles – these kinds of poles are more compact and attracts only small birds such as hummers, orioles or finches and can be placed near the patios or decks. Since they are for smaller birds, having them standing tall is not a problem. Usual height is about 6 ft tall and normally has 4 arms. Putting on a pole has its pros and cons. There are many bird feeder poles that do not need maintenance but there are some that requires enough attention. There are certain pros and cons of installing a bird feeder pole but let’s focus on the pros. 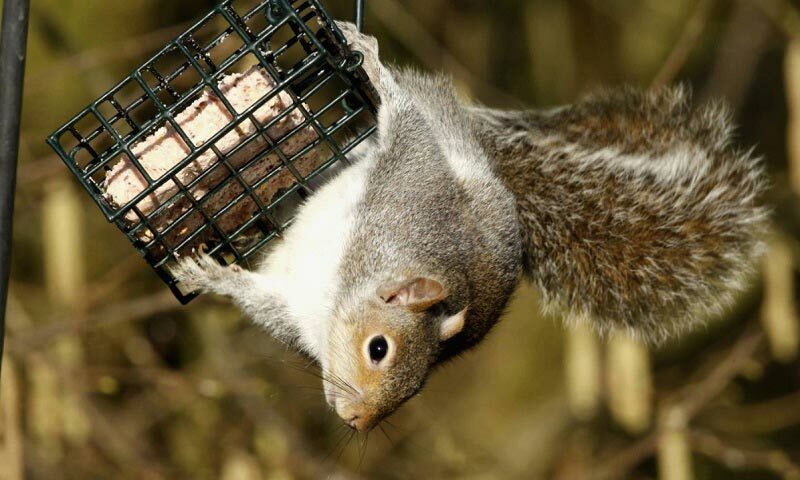 Drive squirrels away – This is probably the most important benefit of using a bird feeder pole. For squirrels, climbing a pole adds one more level of difficulty even they are very crafty. Adding baffles will double the level of difficulty. Some squirrels can jump so do not install it near trees or the fence, which they can use as a springboard to jump. Aesthetic Designs – Some bird feeders have great designs that add beauty to your own garden. It will be great to have them somewhere near the garden, visited by birds and add colors to the already colorful flowers you have around. Solid Metal Design – Most bird feeder poles are made out of solid steel or metal which means that they will last for a long time. Some are even rust-proof so the color or the paint stays. Height Adjustment. Poles come in different height while some have adjustable length. 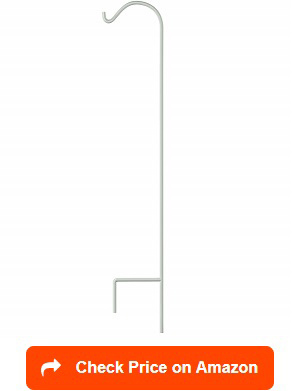 This provides flexibility on how tall your bird feeder pole will be. When adjusting remember that some animals like raccoons and deers and even squirrels can jump a but higher to reach the bird feeder. A distance of 6 to 8 feet from the ground is usually ideal. Location – unlike trees or your house, buying a pole will allow you to have control of where do you want the feeder to be. In can be as far places where squirrel stay or as near your window as possible. Most probably, the most important factor to consider when buying bird feeder pole is on how it affects the birds’ ability to see and use the feeder. There is no point buying an expensive feeder, mounting it on a similarly expensive pole and the birds not finding it. 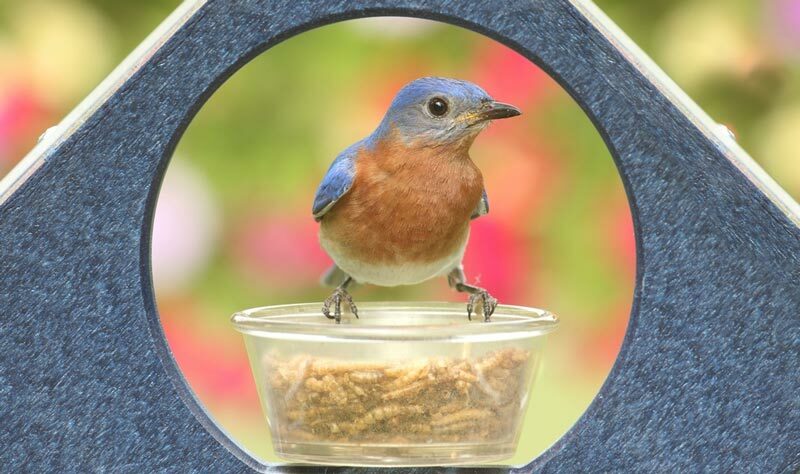 Normally, if birds do not find the location safe or the feeder comfortable enough for feeding, or that it is inconvenient, then they won’t be able to come back for another round of feeding. There are few factors to consider before opening your wallet for the steel rod that will form part of your yard, even if it’s a fact that it is never going to be the star of the bird feeding show. Factor #1: Is it squirrel proof? Yes, you should never allow that pesky squirrel to come and take everything. Expert birders know that a squirrel battle is the hardest to beat. Like the Hydra, one gets defeated and two more appears. 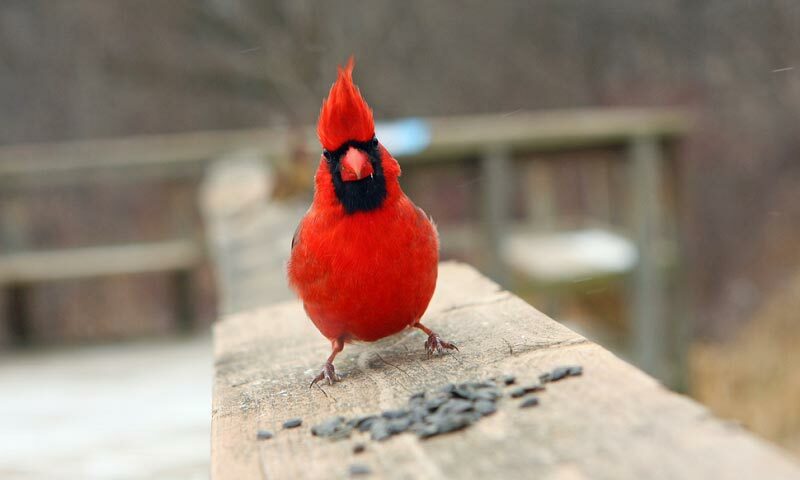 These annoying beast can literally ruin your bird feeding hobby and your mood specifically. Considering this problem, it is time to buy a bird feeder pole that will protect the bird feeder from them. Squirrel proof bird feeder poles are now available in the market. There’s not many but there are good ones too, and some come in reasonable prices. Check out GrayBunny and Squirrel Stopper for the best ones. Factor #2: Is it sturdy enough? Oh, squirrels not only attack your bird feeder pole but it is also affected by natural elements like the strong wind, the snow, the rain and a storm. Knowing these conditions means that purchasing a pole than can survive the brutal weather especially during winter. How much weight can it hold and how much can it hold both the feeder and the elements? 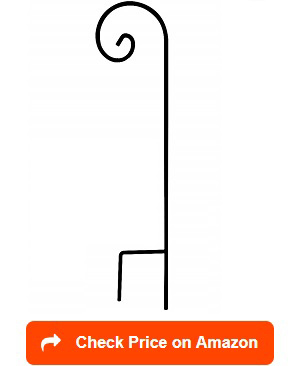 An observation of most poles show that inexpensive bird feeder poles easily bend or break over time after exposure to the elements. It is a good idea to splurge a bit more and keep it for a long time that changing into a new one as often as possible. Most birders want to incorporate the pole as part of their garden layout so having a good design that fits the yard or the garden can be a factor. For others, they even consider the pole as the center of their bird feeding activity. How many hooks do you need? How many bird feeders do you want to place in the pole and how tall the bird feeder pole is practical for your garden. Yes, design matters too! Factor 4: How many can it hold? 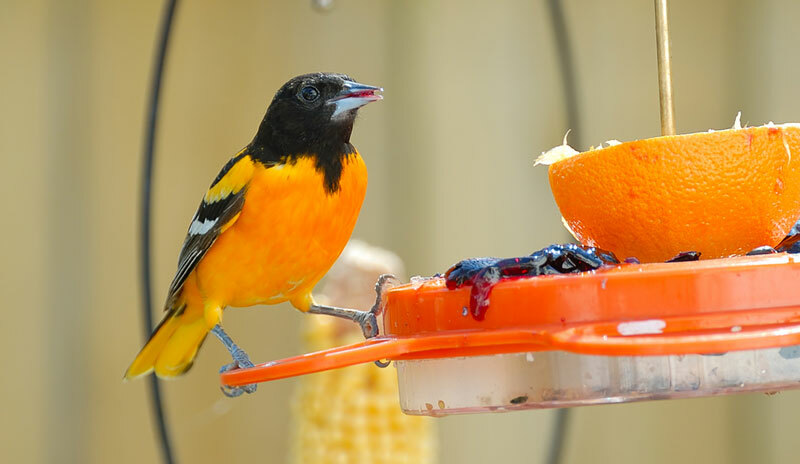 If you intend to make it the center of your garden or your yard, considering how many bird feeders do you need to hang can be a deciding factor. If you are new to birding, it is better to invest early on by buying a pole that can hold quite a number of feeders. 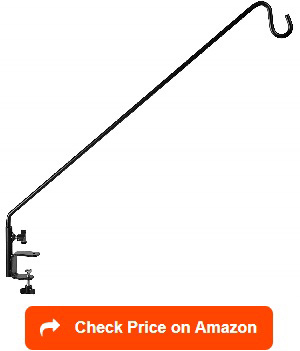 GrayBunny’s bird feeder pole kit might just be what you are looking for. Factor #5: How much does it cost? Like any other product, expensive does not mean the best. However, the fact remains that quality comes with a price. For obvious reason, the more features there are, the most expensive it gets. Bird feeding is a great hobby but I suggest that you should not break your bank for it. If you can afford it and you intend to sustain birding as a hobby, investing now is better than later. How to install bird feeder pole? Since the biggest and the most important part of the bird feeder pole is the pole, installing it becomes really easy. Few screws are required for the arms but assembly are really simple. In fact, most poles require little to no assembly at all. They just need to be planted on the ground. The most important part of the installation process is finding the right location, twisting the pole to the ground, and hanging the feeders you have to the arms. How to stop squirrels from climbing the pole? There are two major ways of solving the squirrel problem. Having a good pole is the first step. A sturdy, weather resistant pole with a built in baffle will send the squirrels in frustration. A tall pole will also deter squirrels from even attempting to climb it. Finding the best location of the pole is the second. A bird feeder attached to the pole in the middle of a vast yard means more difficulty for squirrels to climb and feast on the seeds. 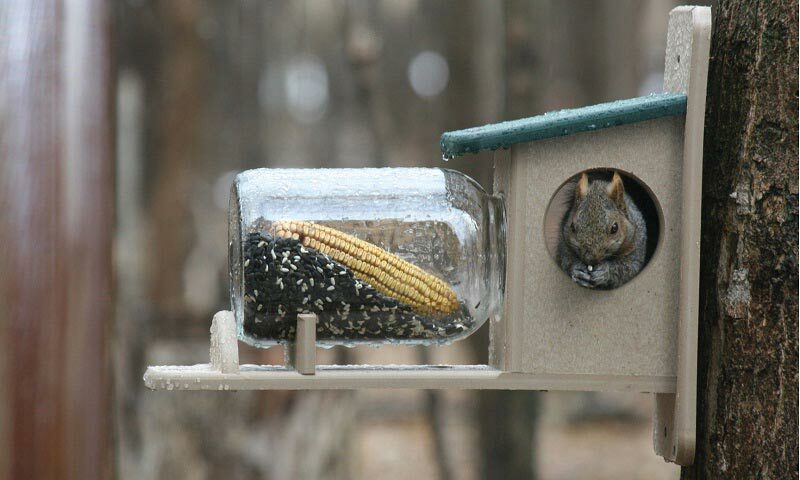 Usually, squirrels use ledge or fence to get into the feeder. The farther your pole is from this areas, the safer the bird feeder and the seeds become. How to make bird feeder pole slippery? Every birder knows that slippery pole is the enemy of squirrels. They do have a very skilled climbing ability but when the metal pole is slippery, they have no choice but to back down. Petroleum jelly – this product that is supposed to be more helpful (for cuts and burns) is actually working against squirrels. It is perhaps the best available birdfeeder defense technology. Butter – an expensive choice but it works just the same. It need re applying, which can account to more money. Some birders have attempted olive oil, regular oil and even wax paper. Depending on how often they come, these might be expensive choice. Perhaps, a squirrel baffle will do the trick instead – at least more permanently. Squirrels are smart animals. Even today, there is no foolproof way of permanently stopping the squirrels from attacking your bird feeders but there are certain ways that may work. Finding the best bird feeder pole may be one of them – a tall, equipped with squirrel baffles and one that may be a little slick will do wonders. If all things does not work, then at least your beautiful bird feeder pole can double work as plant hangers and beautify your yard.